This year, I'm trying to point the casual festival-goer to a handful of movies that are truly wonderful and CRUCIALLY, for which it is still possible to get tickets at the time of writing. After all, what's the point of reading Top Pick lists that tell you to go and watch AMOUR when it was sold out about a minute into the members' booking period? Not that you shouldn't still try to see AMOUR, or ARGO, or the other hot tickets - the BFI does a great job in releasing unused sponsor's tickets, and there are always Returns - keep an eye on the Festival website or follow the BFI on twitter for more info. That said, THE HUNT is a quality movie, fêted at Cannes, that you can still get tickets for, without all the hoop-la. Danish director Thomas Vinterberg - of FESTEN fame - reunites the team behind his most recent quiet, austere drama SUBMARINO, to take a hard look at what happens when an innocent man in a small town is accused of sexually abusing a child. There is no melodrama here - no wild hysteria - but the quiet destruction of a man's life and reputation, the frighteningly casual way in which a man can be ostracised, when a child "says something foolish" and it all gets out of hand. The violence is mostly contained, and all the more frightening for when it does rear up through the façade of bourgeois life - all the more sinister and the more likely to leave a lasting paranoia. There are no easy choices here. The man accused - Lucas - is a humble, beloved kindergarten teacher. A sensitive man who one day offers to walk his best friend's daughter to school so as to escape her parents' argument. No good deed goes unpunished - and to a sensitive child, this special attention, when suddenly coming up against the bounds of proprietary - leads to a heartbreak and a foolish vengeful thought - a thought whose power Klara can barely understand. The poor parents and teachers of course have to take it seriously, even with the accused is their best friend. Which parent has the fortitude to call their daughter a liar? The power of this movie lies in its closely observed, beautifully acted scenes of apprehension and concern. The young actress who plays Klara, Annika Wedderkopp, delicately portrays a child who lies, becomes confused, tries to protest her innocence, simply can't remember, but only knows she's lost her friend. 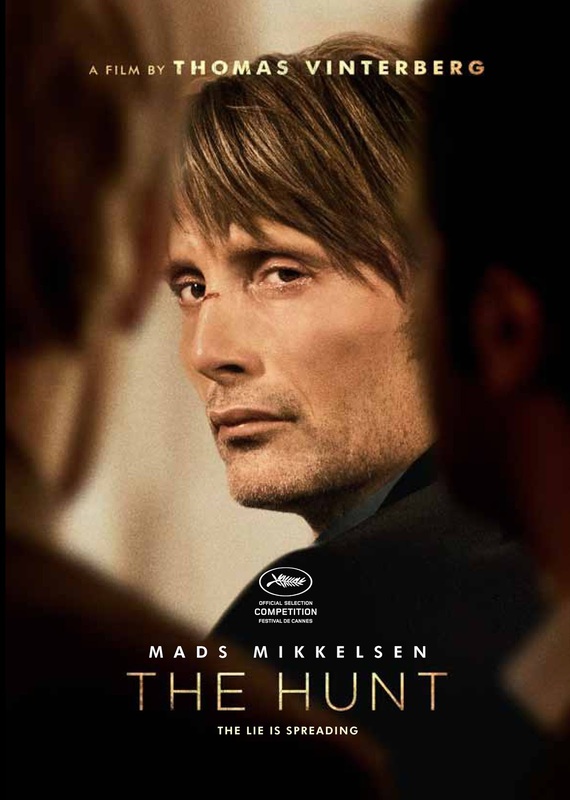 And Mads Mikkelsen is typically superb as Lucas, playing so far within himself one almost forgets his impressive physicality. He truly is an astonishing actor - able to go from hapless, buffoon in PUSHER, to Bond villain, to this almost passive Good Man. There's a particularly tense, cathartic scene near the end of the film, where you can see this two, separated by a movie's length of town panic, broking some kind of reconciliation - and it's quite simply magnetic. Finally, one also has to praise cinematographer Charlotte Bruus Christensen for her richly coloured Danish landscapes and pristine digital lensing. THE HUNT aka JAGTEN played Cannes 2012 where Mads Mikkelsen won Best Actor and cinematographer Charlotte Bruus Christensen won the Vulcain Prize for the Technical Artist and director Thomas Vinterberg won the Prize of the Ecumenical Jury. It also played Toronto and London 2012. It opens on October 25th in the Netherlands; on November 14th in Belgium, France and Russia; on November 30th in the UK; on January 10th in Denmark and Portugal; on February 1st in Norway and Sweden; on March 8th in Iceland and on March 28th in Germany. Running time 110 minutes. Tough material but no explicit sexual content.